Camera modules are electronic devices that convert an optical signal through the lens into a digital electrical signal using an image sensor, and display the captured image on the display device. It can also be defined as a component that provides video recording function, still image function and gesture recognition to a digital device. 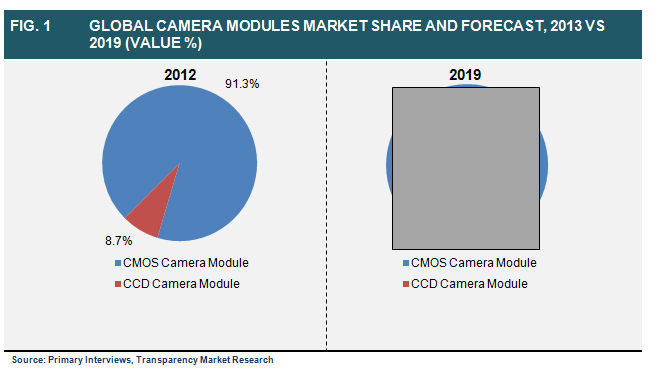 The global camera modules market was valued at USD 12.00 billion in 2012 and is expected to reach USD 43.06 billion by 2019 at a CAGR of 19.7% from 2013 to 2019. It is of two types on the basis of the image sensor technology used in their packaging - CMOS (Complementary Metal Oxide Semiconductor) camera module and CCD (Charge Coupled Devices) camera module. CCD camera modules dominated the camera modules market for a long time but with the emergence and increasing demand of CMOS technology, it started losing its market share. Smartphone and tablet PC is the largest segment of the camera module market. Smartphone and tablet PC segment is expected to see exponential growth in the coming years and this will positively influence the camera module market. Consumer preference towards smartphones, with more pixel clarity and the trend of software development play a significant role in increasing demand for camera modules. For example, impact of Apple, Samsung and LG among others cannot be underestimated as consumers have readily embraced mobile imaging through their mobile phones. In addition, adoption of mobile phone apps for social networking and email (i.e., Facebook, Gmail, Yahoo, and WhatsApp among others) is also contributing to market growth. China, Japan, India, Korea, Taiwan, Singapore and Malaysia are some of the major countries contributing to the growth of camera modules in Asia Pacific. Most of the key players of the camera module market such as LG-Innotek, SEMCO, Foxconn, Sharp, Liteon, Chicony, Toshiba, STMicro, Sunny, and Primax are from Asia Pacific. These players are operating their business in both domestic and international markets and giving tough competition to key players from other regions. The key players in this industry are LG-Innotek, SEMCO, Foxconn, Sharp, Liteon Chicony, Toshiba, STMicro, Sunny, Primax, Samsung Fiberoptic, KMOT, Cowell, BYD, Truly and Vista Point. These players are competing hard against each other to acquire maximum share of the market. The camera module industry is gaining traction as tablet and smartphone manufacturers are persistently developing advanced camera module technologies, thus capitalizing on the sector’s fast growth. With smartphones and tablets becoming equipped with advanced image capturing capabilities and continued thrust on enhancing the resolution of camera units on smartphones, the functionality and reliability of camera modules will be more critical in the years to come. The report segments the global camera module market on the basis of sensor type, application, and geography. Each of the segments is further divided and market analytics presented in the report. The report discusses macro-economic factors that will be favorable to the market as well as the ones that will challenge the growth of the market. Current and projected trends that will have a bearing on the camera module market in the 2013-2019 period are also analyzed in the study. Further, Porter’s five forces analysis included in the report provides insights on market dynamics and competitiveness throughout the value chain. Additionally, market attractiveness analysis throws light on the growth and profitability of various investment areas in the industry. Thus, manufacturers, suppliers, and other entities in the value chain can understand present and future market trends and leverage opportunities available in the industry. In matters of the geographical distribution of the global market, the research report includes market size and forecasts until 2019 for the key regional segments, along with detailed analysis of opportunities available in the camera module market in these regions. Increasing penetration of the markets for smartphones and tablet PCs is the major factor driving the global camera module market. Consumers have adopted mobile imaging through cellular phones, which is apparent from the rapidly expanding markets for Samsung, Apple, and LG devices, recognized for the superiority of their camera modules over other smartphone companies. Growing use of social networking mobile apps is also aiding the growth of this market, since image sharing is an integral part of many social networks, including some dedicated almost entirely to image sharing, such as Instagram, Tumblr, Pinterest, and Snapchat. Due to the favorable impact of such factors, the global camera module market is expected to be valued at US$43.06 billion by 2019, increasing from US$12.00 billion in 2012. This growth amounts to an impressive CAGR of 19.7% from 2013 to 2019. Based on sensor type, complementary metal oxide semiconductor (CMOS) camera modules exhibited a clear dominance in 2012, holding more than half the market. Being extensively used in smartphones and tablets, CMOS camera modules also find applications in other consumer electronics, automobiles, defense and space, industrial, and security applications. Application-wise, smartphones held more than 80% of the total demand for camera modules in 2012. Furthermore, this application segment is expected to exhibit growth at a CAGR of 21.9% from 2013 to 2019. Increasing consumer preference to acquire devices with advanced features, such as rear and front cameras with a high megapixel count, holds promise for the smartphone application segment of the camera module market. LG-Innotek, Foxconn, Liteon Chicony, STMicro, Primax, Fiberoptic, Cowell, Truly, SEMCO, Sharp, Toshiba, Sunny, Samsung, KMOT, BYD, and Vista Point are major companies operating in the global camera module market. Many of the major companies in the global camera module market are based in Asia Pacific, which will help the region emerge as an influential market for camera modules. In 2012, Asia Pacific held almost 60% of the total revenue of the global market.